Where in the world is à la Claude? It has been quite a while since my last blog post – hopefully some of you have wondered where I have been and what I’ve been up to? Has the à la Claude kitchen been closed? Is it under renovation? Under new management? You might be surprised to learn that I am in a land far from home participating in an impressive public health response effort. Since mid-May, I have been deployed through the World Health Organization working with an exceptional team from the US Centers for Disease Control and Prevention in Guinea as part of a huge international effort to combat the on-going Ebola outbreak. 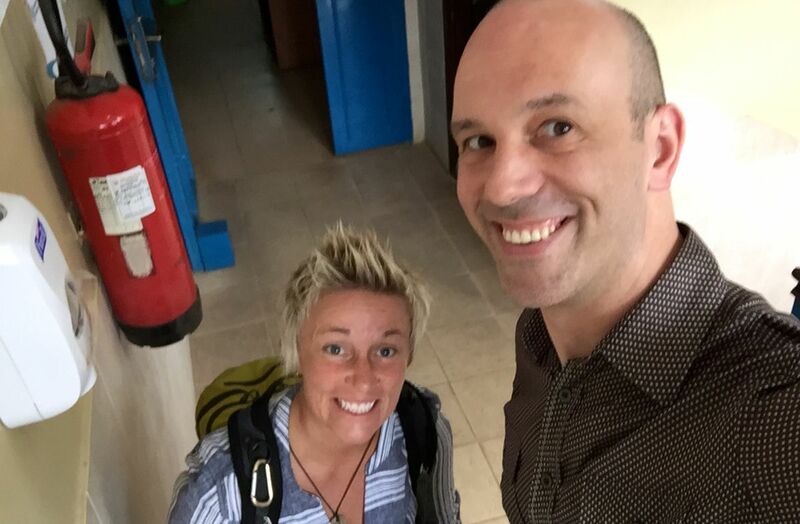 The à la Claude blog usually revolves around food and entertaining but I would be remiss if I didn’t recognize the extraordinary people I’ve been working alongside and most important the people of Guinea who, incredibly, have maintained their stamina and perseverance to continue the fight to end the Ebola epidemic. I am humbled to meet the warm, friendly and incredibly inspiring citizens of our host country. There have been innumerable life experiences over the past month with many to come over my next four weeks. As I’ve professed in previous posts, I enjoy travel and the culinary aspects of exploring other cultures and nations. I don’t feel I have truly experienced a variety of Guinean food – but can share a few accumulated photos and stories. Our deployed contingent are lucky to stay at a very comfortable hotel with superb facilities. 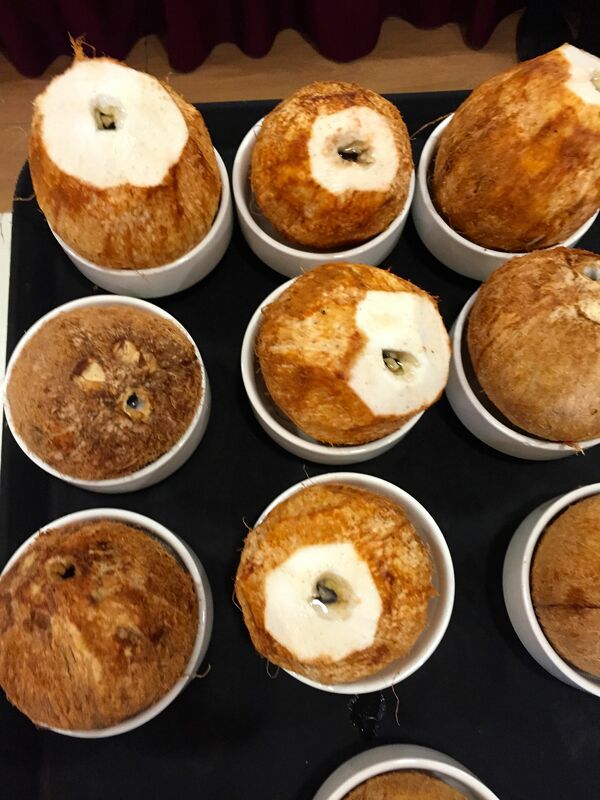 This includes a great European-style breakfast spread which includes sliced meats, cheeses, ample sliced fresh fruit, fresh coconuts, eggs and a few usual breakfast staples, but most important – the French pastries! Every morning there are fresh mini-croissants, rolls and custard, raisin or chocolate-filled pastries in a variety of shapes and sizes. 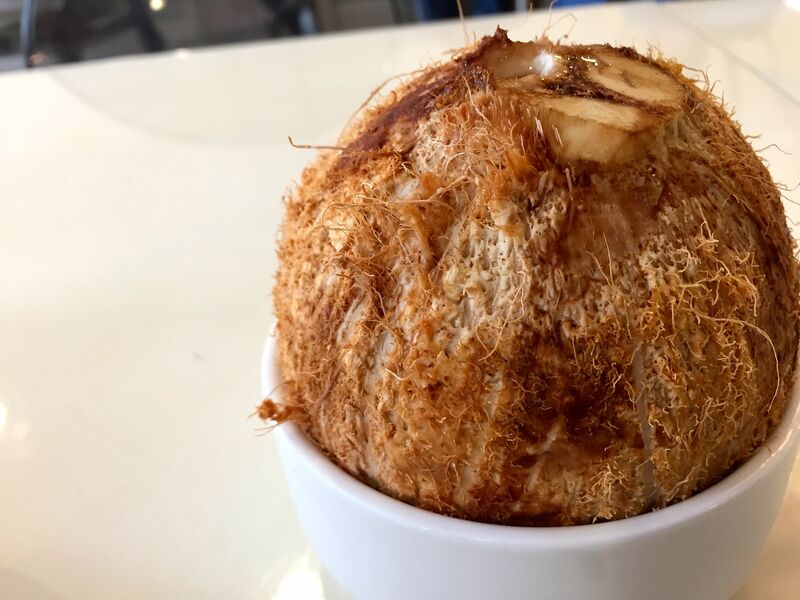 The house restaurant has an extensive menu offering interesting salad options, seafood, beef and lamb, some Lebanese fare, pizzas and several à la carte options. We tend to eat a bit later and often opt for salads. 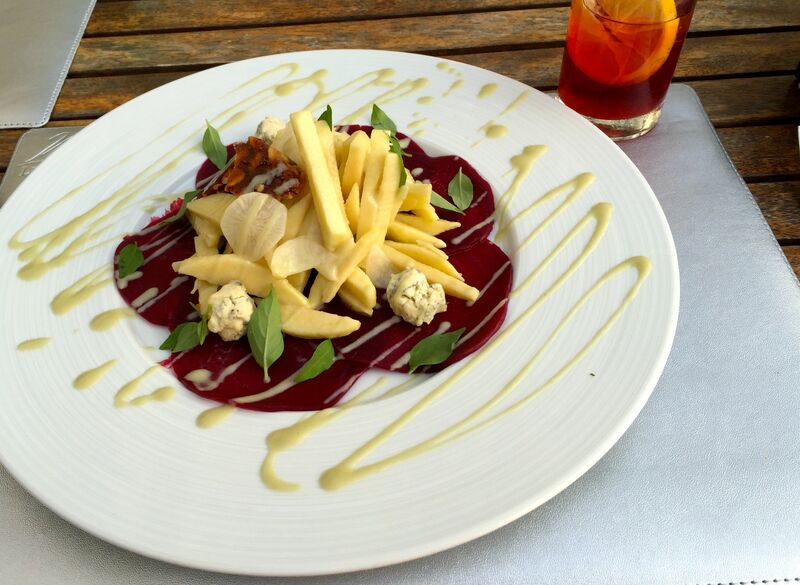 My first was a beet and apple salad with Roquefort cheese with fennel dressing. I was a bit surprised to see the beets sliced to line the plate and topped with julienned apples and sprinkled with small basil leaves. A few Roquefort balls and drizzle of fennel dressing rounding things out resulting in a well balanced and well executed dish. The overall favourite salad features avocado, palm hearts and shrimp – though our dimly-lit dusk time meals do not lend themselves well to great photos – I’ll have to order that one again in the daylight! Last week, I decided to press my luck and try the grouper carpaccio salad. We’ve been cautioned to only eat well cooked items, be very wary of potential water or ice contaminants and the usual list of recommendations for wise travellers. 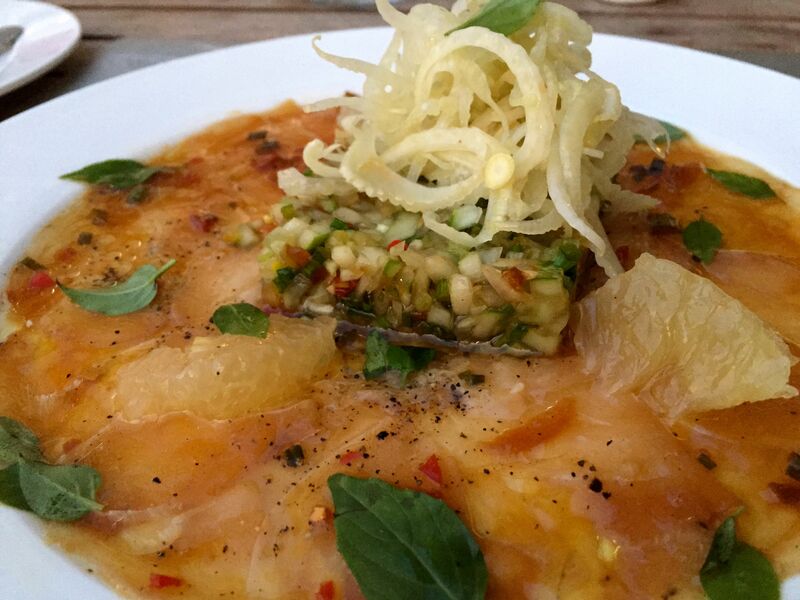 Encouraged by the success of others eating from the hotel menu with few ‘side-effects’, I chose the grapefruit grouper carpaccio with cubed cucumber, jalepeño and fennel. The dish was marvellous – fish thinly sliced, zippy cucumbers and onions topped with slightly pickled fennel. The basil leaves, as most fresh herbs do, brought a fresh summer flavour to the dish which complimented the citrus component. 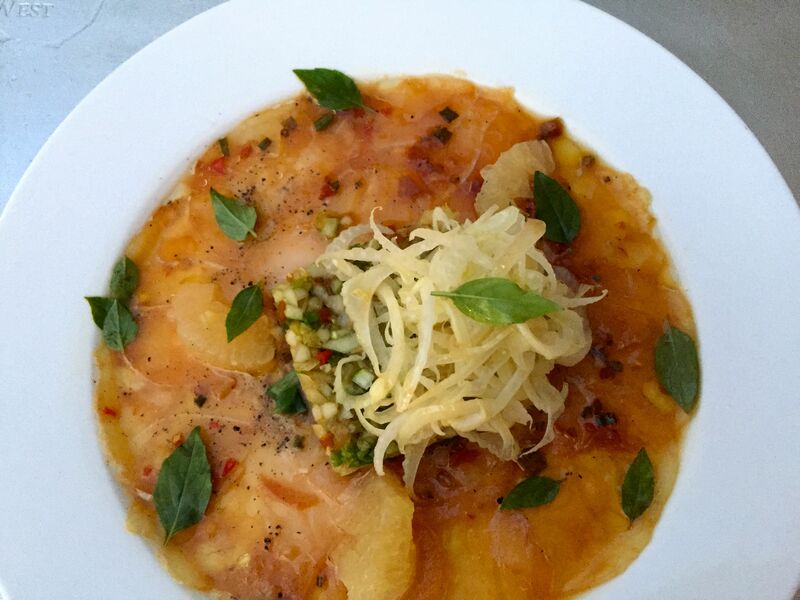 I suffered no consequence with the grouper carpaccio and can see having it again during my stay. I’ve tried a few of the pizzas (seafood pizza on my first night and bolognese pizza a few weeks later) which are well worth ordering. 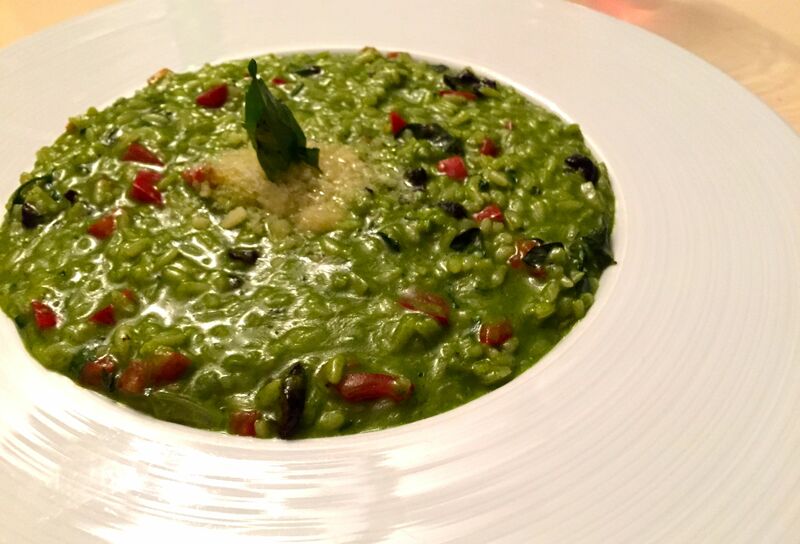 I have yet to try their pasta but had the spinach risotto – an interesting interpretation of risotto with olives and dotted with red peppers. The Millenium hotel boasts a spacious second-story patio/bar/lounge. 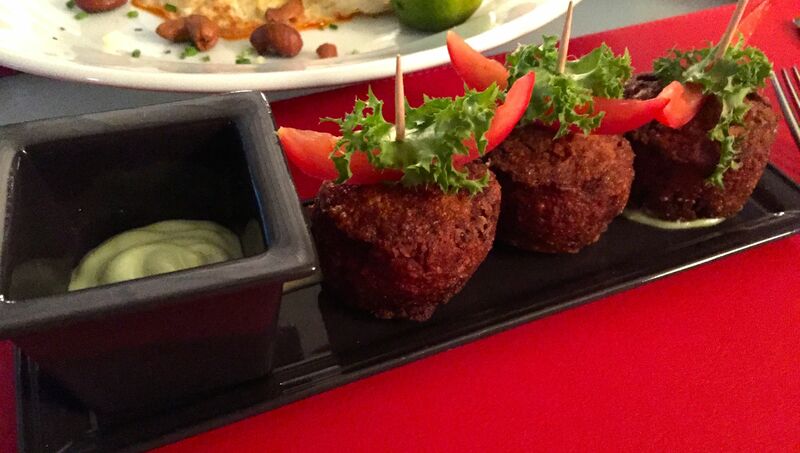 There is a tapas-style menu that has tempted us a few times. One night we went up and ordered a few items – a some were hits but mostly misses. 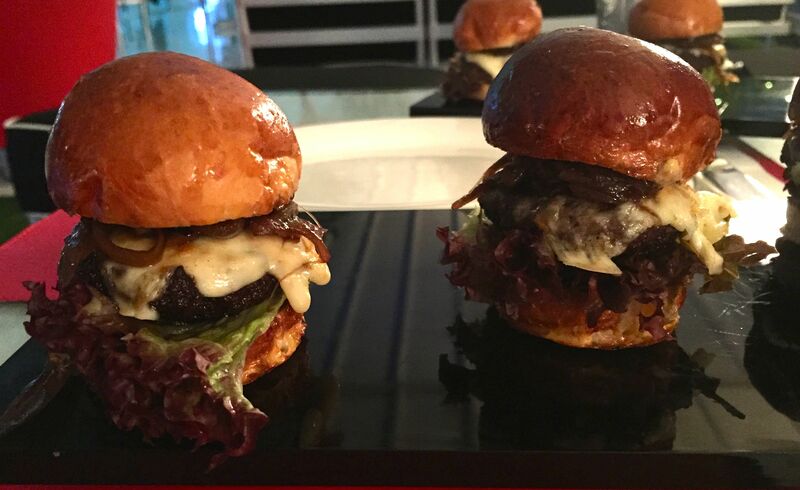 The hit that keeps everyone coming back for more are the cheeseburger sliders with caramelized onions – small packages with loads of flavour! Another almost favourite is the bruschetta – perfectly ripened tomatoes balanced with garlic, onions and EVOO – but served on the toasted mini-slider buns. A bit unexpected and disappointing considering the vast amounts of bread and baguette available for breakfast each morning. Finally a few misses are the chicken shawarmas which were more like chicken bites in a salty à la King sauce, crab cakes with wasabi mayo [read crab dough balls with an inappropriate dipping sauce] and the pad thai. 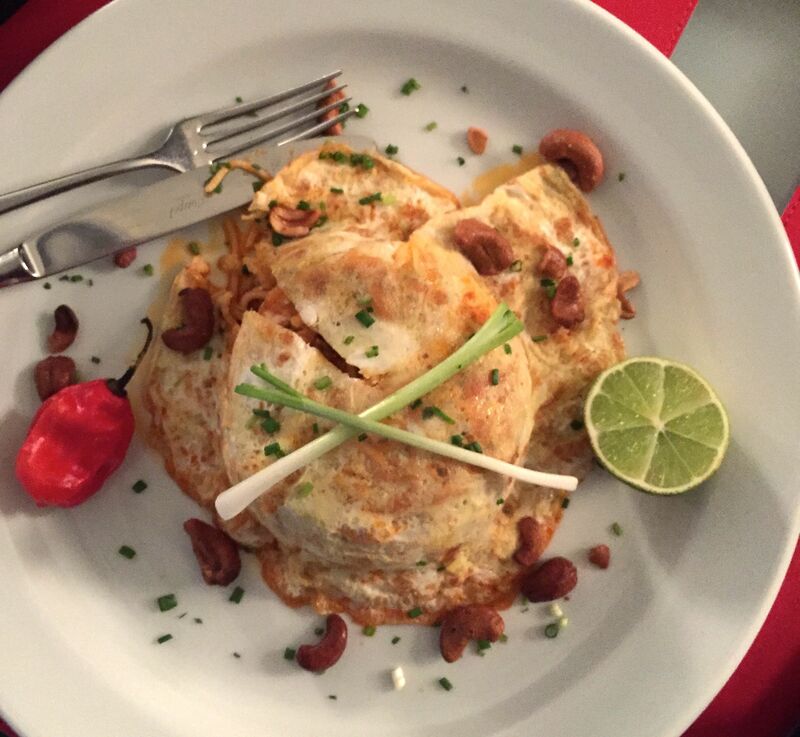 The pad thai was covered in a thin fried egg covering and consisted of mostly spaghetti noodles with a spiced ketchup sauce, fried cashews and some gambas (shrimp). Points for effort but definitely needs to go back to the drawing board! I’m sure I will have plenty of time to try a few more Millenium menu items before I depart Guinea – but my next post will be to share tales and photos from a few other local places… l’Épi d’Or, the Obama Bar, Mon Ami [Korean restaurant] – stay tuned! Well Claude, it looks like we don’t have to worry about you starving over there! I’ve been curious about the food, so I hope there’s a follow up to this post. Bonne histoire mon Claude ……une bonne semaine…..a la prochaine!! Thanks for the richly detailed update Claude! The avocado and shrimp salad sounds wonderful. We are giving fiddlehead a a try, from CJ Andrews . Any hints?